This entry was posted in holster and tagged angled, leather, mag carrier, magazine. Bookmark the permalink. I don’t see left-handed designs for the angled mag carriers? Хм. а не удобнее наклонить вперед? Мне с моим опытом сомнительно такое ношение магазина. Неинтуитивно, но так вроде намного быстрее вынимать в правильном положении для перезарядки. Исходя из моего опыта – магазин при ношении на поясе должен располагаться вертикально или быть наклонен вперед. Передней частью вперед в любом случае. Думаю, что они и такие делают. This looks like they make it easier to be stolen from behind. Have you ever had an issue with a criminal stealing your reloads? I wear a duty belt every day, and that’s the last of my worries. The other problem with spare magazines, is that they don’t solve mechanical malfunctions with the firearm. Most defensive use will not require more rounds than are in the firearm, anyway. I’d rather carry a second pistol. A small pistol isn’t really all that much bigger/heavier than a spare mag, and gives mechanical redundancy. Along with my knife, my back-up knife in case the blade breaks, my ASP, my handcuff key, my lockpick, a few Traveler’s checks, some unmarked, nonsequential $20 bills, extra ammo for both guns, a compass, my water purification pills, a one-man tent…. We’re not discussing carrying extra things. We’re discussing a situation in which someone has already decided to carry a spare mag. My point is that, if one is going to do so, carrying a spare gun, instead, is not a major difficulty. Concealed carry. Concealing a spare magazine is much easier than concealing a spare weapon. I don’t want a flame war, but carrying a spare magazine may make sense for some. But it begins to look paranoid to a jury when you have a second weapon in case the first one runs empty or has a malfunction. Except that a huge majority of malfunctions are magazine rather than firearm related. As long as you have a quality firearm, mags are going to be THE weak point in the system. Which is still addressed by grabbing a spare gun. In the middle of a gunfight, I’d rather not waste time trying to diagnose a malfunction. Plus, storing the magazine outside the firearm just gives more possibility of damage if you fall on it, or somesuch, making those magazine malfunctions more likely. Angled mag carriers look like a good idea. The question for me is: canted to the rear (easier to grip) or canted to the front (where the gun will be)? 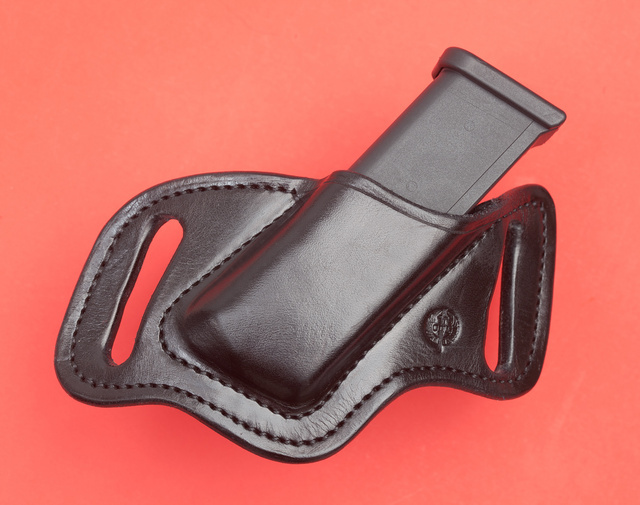 Our “Reverse Cant” mag holder was designed to be worn in the front of the body as you would an appendix style holster, the magazine is pointed to the rear of the body. 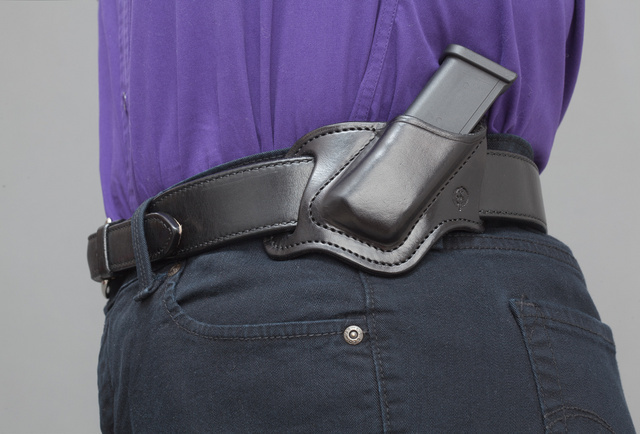 Worn in the front not only allows you to guard your spare magazine but allows you to do a lightning fast reload as it places your hand, wrist and, elbow in proper alignment with one another giving you efficiency of movement. We RH and LH versions. I agree, shooting defensive pistol, a mag canted forward works much better for me. It is like a gun. Yet it is not a gun. An abomination to be melted down. Seriously. Went shooting this week with a CZ-75(newish one) and a Glock. 75’s, I managed not bad groups..With a Glock, I could not even keep all of it on an A4 paper. Gave up in disgust. Also, gun has too few controls and options. I like DA/SA and prefer it to any other system. Had one malf with the CZ-75, failed extraction, stuck out like stovepipe. Doubt it was limpwristing..
A lot of malfunctions are magazine-related. Damaged feed lips or too-weak springs can cause issues. Still falls upon the operator’s shoulders, though, as it’s his responsibility to maintain his equipment. Re “carry a spare gun” — in some benighted states you can only carry one gun.